The Grand is a lovely Victorian property set in a wide treelined avenue. It boasts many original features, high ceilings and large airy rooms with wooden floors and gas central heating.. The rooms are tastefully decorated and stylishly furnished. The large kitchen/diner is well equipped with most modern conveniences including a range style electric cooker, American style fridge/freezer,table and chairs, microwave, large toaster, electric kettle, blender, electric juicer.The living room and dining area are perfect for entertaining or relaxing. There are five large bedrooms, 2 on the first floor and 3 on the 2nd floor. There are 2 bathrooms and 1 cloakroom. Both the seafront and the high street with a comprehensive selection of supermarkets, cafe's, restaurants, butcher, wine shop, fruit and vegetable store,and many individual shops is a few minutes walk from the property. 1. "THE GRAND" AND 2. "HIDEAWAY"
1. "THE GRAND' is a spacious 5 bedroom maisonette which comprises the top two floors of this character house. The Grand sleeps 12 guests ( up to 14 with prior approval). There are two bathrooms and a separate cloakroom with basin and toilet. There is a large kitchen/diner and large lounge/diner. The Grand has its own separate external front door. The living areas are accessed from an entrance porch and hallway and up a wide shallow staircase. 2. "HIDEAWAY" is a large 3 bedroomed ground floor apartment which sleeps up to 8 guests and has its own separate external front door. There is a secluded Japanese styled garden at the rear of the house which is perfect for alfresco dining or BBQ. Both are stylishly decorated and furnished to a high contemporary standard. Equipment provided is comprehensive. Complimentry High Speed WIFI, available. Fully fitted kitchens with American Style fridge/freezers, microwaves, washing machines, dishwashers, Glasses, cutlery, china, pans cooking utensils, cafeterias. large flat screen televisions, with Freeview, DVD players. Some televisions have WIFI facility. The property is perfectly situated a few minutes walk to the clifftips witg a short walk down to the beautiful clean blue flag status sandy beaches which stretch for 9 miles. There is also a lift available Southbourne high street, with its comprehensive selection of shops, supermarkets, restaurants, pubs, cafes, takeaways, is also a few minutes walk from the property. Activities such as surfing, wind surfing, kite surfing, canoeing, sailing, fishing, paint ball, bowling, horse riding, gliding are available locally. Easy access to the New Forest, Isle of Wight, Poole. Sandbanks, Weymouth, Salisbury, Christchurch. Romsey, Corfe Castle, Brownsea Island and Jurassic Coast, to name but a few. Monkey World, Weymouth Sealife Centre , Bournemouth Oceanarium, Beaulieu Car Museum National Trust properties are also close by. I love living by the sea. I have four children and two grandchildren. I have travelled extensively and lived in many places, but I really love this house. Location, Location, location! 7 miles of beautiful blue star award winning sandy beaches are a few minutes walk from the property. The area boasts fabulous restaurants, beach bars, pubs, shops, sailing, horse riding, golf,water sports. 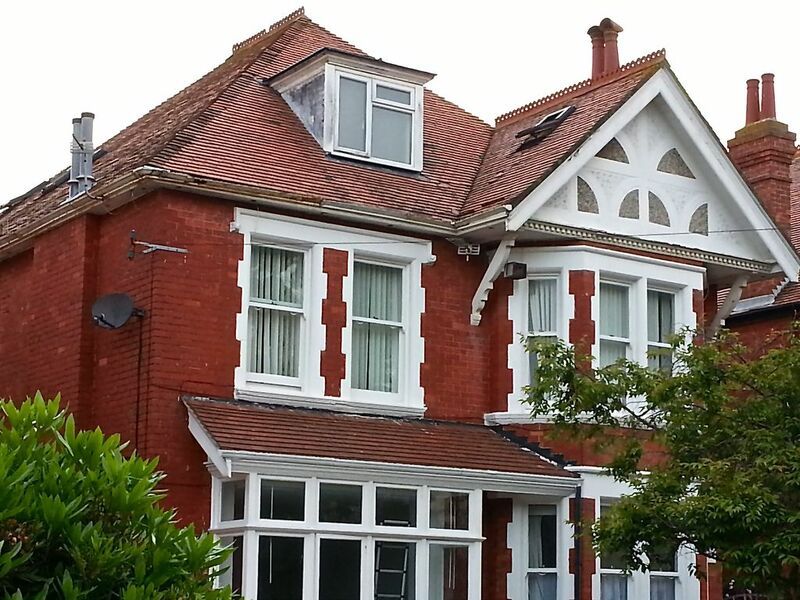 The property is very conveniently situated for access to Bournemouth town centre with all its shops and night clubs and excellent night life. Poole, Weymouth,New forest, Isle of Wight, Lymington, Winchester, the famous Brownsea Island. Poultons Park to name a few. Pokesdown Train station is within walking distance of the property. Bournemouth Train Station is approximately 10 minute drive away. Buses leave from the high street (a couple of minutes walk from the property) to many destinations. Bournemouth International Airport only 15 minutes drive from property. This beautiful Victorian character property retains many original features. It has large comfortable rooms and is set in a beautiful tree lined avenue with 7 miles of beautiful interrupted sandy beaches at the end of the road. Bournemouth boasts a micro climate so the weather tends to be warmer than the rest of England. There is something for everyone in the Bournemouth area, whether ones interest is history, sport, walking, shopping, or just relaxing on the beach. We have the most wonderful beaches in Southbourne and Bournemouth. Over 8 miles of clean sandy award-winning beaches stretching from Henglesbury Head to Poole. Southbourne is a dog-friendly beach. This property is unique being only a few minutes walk to the seafront; a few minutes walk to the high street with its great selection of individual shops, micro-pubs ,bars, cafe's, restaurants. Offroad parking for 2 cars. Plenty of FREE parking on the avenue outside the property. High speed internet with BTHome boosters to obtain wireless in every room. Large range style cooker with 2 ovens and internal oven/grill. Large fully fitted kitchen with base units and wall cupboards, wooden worktops,1.5 bowl sink, kitchen blind, boiler and radiator. Kitchen table and chairs. Large extending glass dining table and 12 chairs. Large white folding table and 8 white folding chairs suitable for buffets etc. Padlde boards, kayak's and other watersport and sports equipment can be rented locally. There is a dry ski slope about 5 miles from property near Bournemouth airport. There are many excellent golf courses in and around the Bournemouth area. THE GRAND (5 bedroom Maisonette) - Gas central heating. Internet access. Freeview Television. Suitable for children. Well behaved, house trained dogs allowed. (£30 charge each dog.) Off road parking. Perfect holiday destination - something for everyone. Dogs are allowed on the beach. Hen parties, wedding parties, etc. welcome. Linen and towels NOT INCLUDED - this service can be arranged for £8 per person for linen and towels. £5 per person for linen. Beds are made up within this price structure. £300 FREFUNDABLE DAMAGES DEPOSIT OUTSIDE THE GRAND There is a paved front garden area with shrubs, This can be used for parking . We had an amazing time. We had everything we needed and Susie (the landlady) was super helpful. A truly wonderful and stylish property, aptly named The Grand. Just a stones throw from the beach, coastal walkways and cafes. The owner had thought of everything to make our stay as comfortable as possible. Highly recommended. We really enjoyed our stay at the Grand. The property was well suited to our large family gathering - lots of beds and well equipped for infants (stair gate, high chair, etc.). The location is superb - a short walk to the beach in one direction, a short walk to shops and services in the other direction. Susie was a pleasant and responsive host - we would definitely stay here again. The 14 of us had an excellent stay at The Grand - there was ample room for all and we had a very special hen weekend. The property itself was in excellent condition, clean and well-equipped for such a large number, I would definitely recommend! Furthermore, we were a 5 minute walk from the beach in one direction and a high street in the other, so felt well located despite being on the outskirts of Bournemouth - taxis are super cheap so wasn't a problem getting into town. Would also recommend Chinese buffet and karaoke at the LAN club, and It's a Knockout for anyone looking for a fun activity on a hen weekend! Great location, lovely big, clean property!! This is the second time booking this property, although my first stay! The house was so clean and spacious, ideal for large groups. We have small children who all loved the house, with enough space for them to all play. The location was fab, minutes to the beach, which was ideal for us. Considering it was the school holidays the beach was quiet with lots of room to run around! We used public transport to go into Bournemouth which was about a 20 minutes journey. I would say it was difficult to find the relevant stops in Southbourne and in Bournemouth, so check all details thoroughly before travelling! Susie the owner was happy for us to check in early and helped with all my questions prior to our arrival. She was very helpful and friendly during our stay. We are already looking to book again for next year!! There are 7 miles of magnificent sandy beaches around Southbourne and Bournemouth area which have been awarded the blue flag of excellence for their superb cleanliness. From the property it is a 2 minute walk to the cliffs and beach. Cafe Riva on the clifftop has a great view 'Bistro on the Beach' a 15 min stroll along the beach. There's a chain ferry from Sandbanks (20 mins drive) to Shell Bay. Bournemouth Int. airport is approximately15 mins drive. Bournemouth Train Station 10 mins drive. Poole Ferryport 30 min drive from property. Portsmouth Ferryport 2 hours drive from property (these times are approximate). A car would be useful with so many amazing places to visit in the area, but not essential as the beach, shops, restaurants, pubs, bars, takeaways are within walking distance from the property. ,Co-op supermarket 5 mins walk away. There is a Tesco convenience store in Southbourne, at the end of Grand Avenue which is open till 11 pm every evening.Sainsbury's store 2 min from property. 24 hour Tesco's 10 mins drive from property. Most major banks in Southbourne High Street. Specialist Butchers and specialist wine shop. Lots of cafe's, bar/restaurants locally. There are excellent restaurants in Christchurch which is about 8 minutes drive. The Boathouse, Kings, Masala Bay Indian Restaurant, Five minutes along the seafront is Boscombe Pier where there is a fantastic beach bar and first class restaurant called URBAN REEF. Booking Notes: Deposit of 25% required to secure a booking. Payments can be made by internet bank transfer or direct payment into bank account at a bank. No credit or debit card facilities. Balance 6 weeks prior to arrival date.Whole balance required immediately for late bookings. £300 security deposit against damage and breakages required. £20 charged per dog per week. We do not supply linen (ie sheets,pillow cases,duvet covers) and towels. Linen & towels can be arranged £8 or just linen for £5 per guest. Changeover Day: Changeover day is Friday. Guests are requested to vacate the property by 10am. Arrival time for new guests 4pm. onwards. Guests may drop off their belongings earlier by arrangement. Notes on prices: Prices are for the property per week in UK Pounds. A deposit of 25% of the total cost is required to secure a booking. The balance is due 6 weeks prior to arrival date. Refundable security deposit of £300 against damage and breakages is required. £30 charged per dog per week. Linen (sheets, duvet covers, pillow cases) and towels not included in price but can be arranged for £8 per person per week.